The PSNI have assured those who attended the tragic St Patrick’s Day event in Cookstown that they are only interested in what caused the deaths of three teenagers - not in the fact that underage children were queuing for a licensed premises. 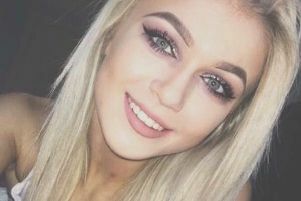 The PSNI focus, he said, is to find out what happened which resulted in the deaths of three teenagers after an apparent crush in a queue into the hotel on Sunday night. Lauren Bullock, 17, Morgan Barnard, 17, and 16-year-old Connor Currie, died after the incident outside the Greenvale Hotel, Cookstown, on Sunday. Books of condolence are being opened for the victims today. In a press conference this morning, DSI Murray, said: “It is now just over 24 hours since we launched our investigation into the tragedy that unfolded at the Greenvale Hotel in Cookstown on Sunday night. “I want to extend my heartfelt sympathies to the families of the three teenagers who so sadly lost their lives – 16-year-old Connor Currie from the Dungannon area, 17-year-old Lauren Bullock from the Donaghmore area and 17-year-old Morgan Barnard also from the Dungannon area. It is difficult to appreciate the level of grief these families must be feeling as Sunday turned into their worst nightmare. “A number of parents have indicated they are concerned that their children, who may have been underage, were trying to enter a licensed premises. I want to reassure you, the focus of our investigation is not the age of people who were at the event – it is about trying to find answers for the families of the three teenagers who tragically died – we need to know what you saw so the heartbroken families of Connor, Lauren and Morgan know what happened to their children. Witnesses can also visit the dedicated room at the Burnavon Arts Centre in Cookstown, open from 10am this morning, Tuesday 19 March. Anyone with any information, images or footage can also pass it to police via the following link: https://mipp.police.uk/operation/PSNI19O08-PO1.